Follow the steps below to remove and disassemble the Karbon kitchen or bathroom sink faucet sprayhead assembly. IMPORTANT! Retain and protect any parts that are removed during this procedure. 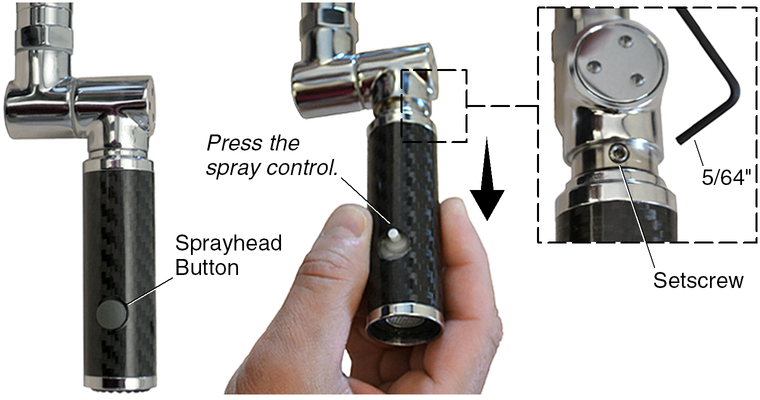 Carefully pry off the sprayhead button from the spray control. Simultaneously press in on the spray control and pull outward on the housing to expose the setscrew. NOTE: The assembly is spring loaded; hold on to the housing during this step to prevent damage and loss of parts. Use a 5/64" hex wrench to remove the setscrew and detach the sprayhead from the faucet. IMPORTANT! Do not lose the spring located inside the housing. The spring will be loose when the sprayhead assembly is removed. Press in the spray control to release the housing from the sprayhead assembly. Pull the housing and sprayhead assembly apart. Make sure the spring is in place in the housing. Press in the spray control, and slide the housing over the sprayhead assembly so the spray control is in line with the hole in the housing. 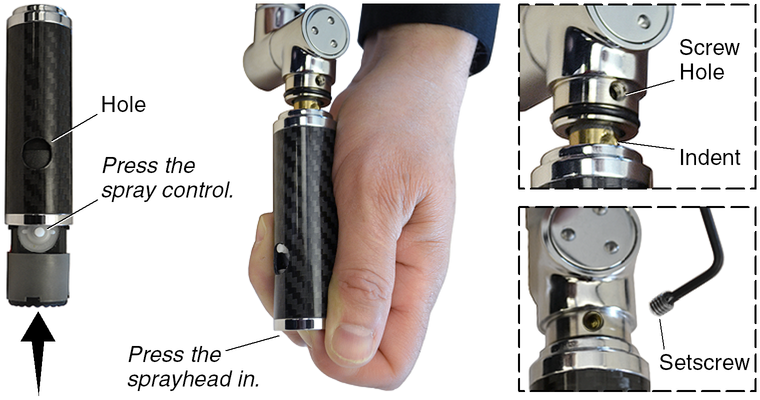 Press inward on the end of the sprayhead, and insert the sprayhead assembly into the faucet so the indent lines up exactly with the setscrew hole. Use a 5/64" hex wrench to reinstall and tighten the setscrew. Press the sprayhead button onto the spray control.